This new collection of writings describes the recent thinking of psychologists and educators regarding interactive development across the spectrum of competency domains within the individual. Significant research efforts emphasizing innovations in qualitative methodology, pedagogical refinements, and therapeutic interventions--both remedial and prophylactic--are presented to illustrate recent applications of current life-span development theorizing. The volume begins with a section devoted to theory and practice in educating for human development; this is followed by sections examining counseling for development, and educating for morality, religion, and citizenship. 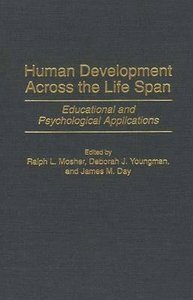 About "Human Development Across the Life Span"